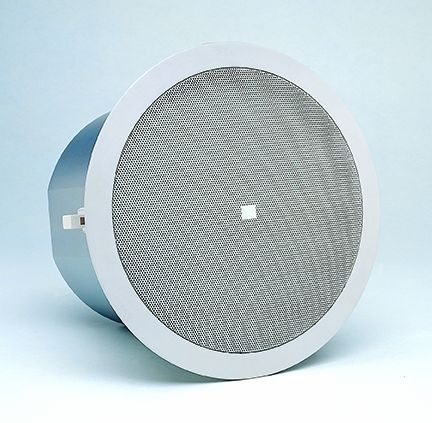 JBL Control 19CS Ceiling Speaker DJParts - All Variety of Parts that DJ Needs. Control® 19CS/CST In-Ceiling Subwoofer Input connection is conveniently provided on a removable locking connector (included), providing secure connection via screwdown terminals and allowing a system to be prewired before installing the speaker for fast snap-on convenience. Separate connector terminals are available for the input and for the loopthrough wires, making it easy to jumper the speaker signal to additional speakers. The input terminal plate provides strain relief for either bare wire, plenum cable or ½ inch conduit (12 mm I.D.). The terminal box is securely enclosed to meet safety codes. The speaker trim and grille are paintable to match any decor. A paint shield is provided for covering the drivers while painting the rim. Installation of the Control 19CS is quick and easy. The loudspeaker is packaged complete with the backcan, grille, support backing bracket and tile rails. The entire installation can be accomplished without requiring access above the ceiling. A template is provided for marking the cutout. An innovative C-shaped support backing plate can be installed from below through the cutout to reinforce the top of the ceiling material. Tile bridge rails are included which can be screwed onto the C-plate to extend support to the T-channel grid in suspended ceiling installations. After the speaker is fitted through the cutout, it is held securely in place via three mounting tabs which tighten onto the C-plate, if used, or directly onto the ceiling material. The Control 19CS backcan is made of formed steel and the speaker is suitable for use in air handling spaces, per U.L.-2043. An attachment loop is provided on the backcan for cabling to the building structure as a secondary support in seismic areas or where required by code. The optional Control 19CST version includes a high quality multitap transformer designed specifically for subwoofer use in either 70.7V or 100V distributed-line systems. Multiple transformer taps at 75W, 30W and 15W (plus 7.5W at 70.7V) allow the Control 19CST to fit a wide variety of listening situations. Taps are selected with a rotary switch conveniently located on the front panel, protected under the grille, so that the speaker does not have to be removed to adjust tap settings. The transformer effectively limits the power to the speaker, so SonicGuard is not included in the Control 19CST. Frequency response (1W, 1 m) is measured on-axis with two boundary junction (loading, gray line) and with three-boundary junction (2 loading, black line) Impedance vs. Frequency Dimensions in inches (mm) Architectural Specifications: The subwoofer loudspeaker shall be of in-ceiling design, consisting of a 200 mm (8.0 in) low frequency transducer in a Nested ChamberTM ported enclosure. The low frequency voice coil shall be 38 mm (1½ in) in diameter and the coil former shall be of aluminum for maximum heat dissipation. Performance specifications of a typical production unit shall be as follows: Measured sensitivity (SPL at 1m [3.3 ft] with 2.83V input, averaged from 60 Hz to 100 Hz) shall be at least 95 dB-SPL (2 loading). Usable frequency response shall extend from 42 Hz to 200 Hz (10 dB below rated sensitivity) with no external equalization. Rated power shall be at least 100 watts continuous pink noise power, AES spectrum (shaped pink noise, 40 Hz to 400 Hz, with peak-to-average ratio of 6 dB) for a period of 100 continuous hours. The system shall be protected against damage from occasional overpowering via full range series lamps that limit the power to the transducer (Control 19CS, not Control 19CST). The backcan shall be constructed of formed steel and the baffle of UL94V-0 fire rated medium impact polystyrene. An enclosed terminal box shall be included proving strain relief for use with either plenum-rated wire, ½ in (13 mm inside diameter) conduit, or flexible conduit up to 22 mm (⅞ in) outside diameter. The external wiring shall be accomplished via a removable lockable wiring connector with screw-down terminals to provide both secure wire termination and prewiring capability before loudspeaker installation. An attachment loop shall be provided on the back panel for tying to building structure as a secondary support point. The system shall include a support backing plate to reinforce the ceiling material and tile support rails for use on either 2 x 4 ft or 600 x 1200 mm suspended ceiling tiles and which can all be installed from beneath the ceiling tile. Overall front face diameter shall not exceed 345 mm (13.6 in), overall depth from the bottom of the ceiling shall not exceed 318 mm (12.5 in). Control 19CS: The loudspeaker shall weigh no more than 5.5 kg (12 lb) and nominal impedance shall be 8 ohms. Control 19CST: The loudspeaker shall weigh no more than 6.3 kg (14 lb) and shall be equipped with a special subwoofer-capable transformer for use in either 70.7 or 100V distributed-line speaker systems, with taps selectable by rotary switch located on the front panel so that the speaker does not have to be removed to adjust tap settings.